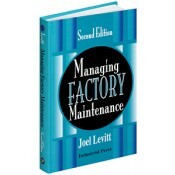 Tap into Joel Levitt's vast array of experience and learn how to improve almost any aspect of your maintenance organization (including your own abilities)! This new edition of a classic first educates readers about the globalization of production and the changing of the guard of maintenance leadership, and then gives them real usable ideas to aid in these areas. Completely reorganized so that material is presented within the context of major sections, the second edition tells the story of maintenance management in factory settings. It provides coverage of potential problems and new opportunities, what bosses really want, specifics for improvement of maintenance and production, World Class Maintenance Management revisited and revised, quality improvement, complete coverage of current maintenance practices, processes, process aids, interfaces and strategies, as well as personal and personnel development strategies. • Provides specific “how-to” tips and concrete techniques and examples for continuous improvement. • Updates the 20 steps to world class maintenance to include the 6 areas of focus for world class maintenance. • Breaks down and explains the three-team approach to maintenance work. • Offers new sections on: managing shutdowns, craft training, and communications. • Contains major revisions to the RCM discussion and includes a new discussion about PMO. • What is the Context for Managing Maintenance? • Maintenance Interfaces: Where Does Maintenance Fit In?